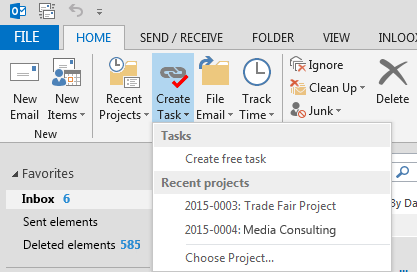 Everywhere in Microsoft Outlook, you will find the InLoox buttons Recent Projects, Create Task, File Email and Track Time in the Ribbon on the Home tab. This enables you to use items from Microsoft Outlook in InLoox with just two clicks. Click on Create Task to turn them into a task for self-management or to assign it to any of your projects. 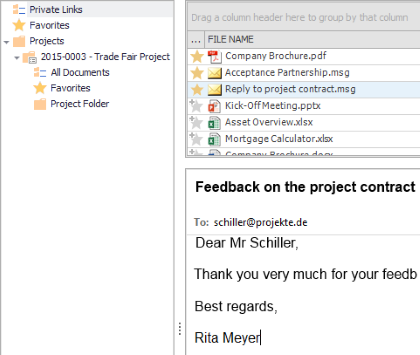 When you click on File Email, you can assign the e-mail directly to a project. The e-mail will be stored in the document folder of the project. You can also track the effort that the e-mail implies and assign it to a project. To do so, click on the Track Time button, enter the effort and assign it to a project. Beyond that, we restructured the InLoox Ribbon so that you will find the buttons New, Edit and Delete in each section on the very left. This makes it very easy to find your way through the software. Now, you can sort project-independent documents into folders – directly in InLoox. You can also add personal documents and manage them together with your project and department documents all in one place. In the Documents section in InLoox PM, you’ll find a folder tree structure. There, click on Private Links. Now you can click on the Start tab in the Ribbon on New private Link to create a link to a personal document. Now select the regarding document from your computer or your file server. The document is now linked to in InLoox PM without having to have a relation to an InLoox project. Other InLoox users cannot access the document. 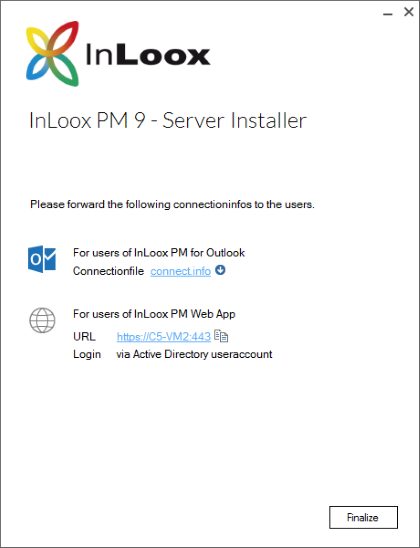 If you use InLoox for Outlook in combination with InLoox now! you can also upload documents. Just follow the same steps as if you were to create a personal link in InLoox PM. If you want to assign the document to a project later on, please click on the InLoox PM tab in Microsoft Outlook, then on the Documents button on the Start tab. There, you can click in the Actions group on the Start tab on the Assign Project button and select the regarding project. The new InLoox PM 9 installation pack is significantly smaller than the ones in previous versions. The client installation is now done with only two clicks. Please read our installation whitepaper for a detailed instruction. In version 9, you can implement further systems of your everyday operations, e.g. your accounting software. 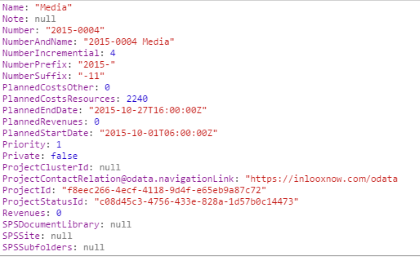 A programming interface (API) makes it possible for you to avoid media disruptions and helps you to analyze data across different systems (Enterprise users only). The new InLoox report designer allows you to create and modify project reports in a fast and easy way. You don’t need any advanced programming skills to implement custom or complex requirements into your project reports. The new report designer exists alongside with the previous one in version 9 so that you can keep using the project reports that you designed in the past. 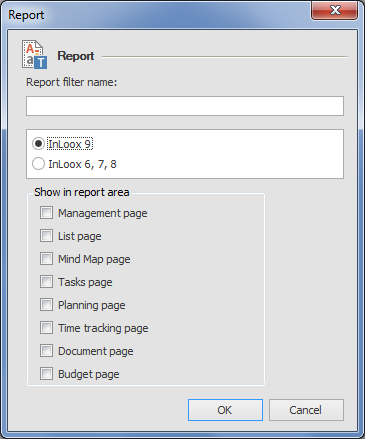 To create a new type of report, please click on File in Microsoft Outlook, then on the InLoox options. In the Reports section of the InLoox options, click on New. There, you can select whether you want to create an InLoox 9 report with the new report designer or if you want to design a report with the old report designer (InLoox 6, 7, 8). InLoox PM shows you the version of the report designer existing report templates have been created with. Note A report that has been created with the InLoox 9 report designer cannot be opened and edited in older versions of InLoox PM for Outlook. Ease of use | InLoox 9 for Outlook • Copyright 1999-2019 © InLoox, Inc. All rights reserved.